Water damage occurs whenever water begins to collect someplace it shouldn’t, whether that be your kitchen floor or the corner of your basement. No matter what the reason may be, you need to act fast! Contact SM Absolute for all your water damage restoration needs, and let our team of professionals clean up the mess. Read on to learn what the top causes of water damage are in most homes. 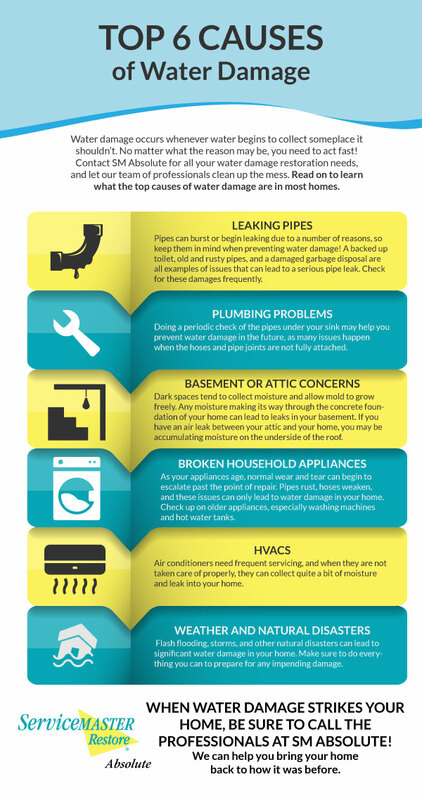 Pipes can burst or begin leaking due to a number of reasons, so keep them in mind when preventing water damage! A backed up toilet, old and rusty pipes, and a damaged garbage disposal are all examples of issues that can lead to a serious pipe leak. Check for these damages frequently. It’s unlikely that you will be able to check the status of the pipes in your walls, so don’t stress too much about them unless you have an older home. Calling in a professional to take a look can never hurt! However, when it comes to keeping an eye on things yourself, there are places you can check in your home. Doing a periodic check of the pipes under your sink may help you prevent water damage in the future, as many issues happen when the hoses and pipe joints are not fully attached. Any exposed pipes should also be monitored. Dark spaces tend to collect moisture and allow mold to grow freely. Any moisture making its way through the concrete foundation of your home can lead to leaks in your basement. If you have an air leak between your attic and your home, you may be accumulating moisture on the underside of the roof. As your appliances age, normal wear and tear can begin to escalate past the point of repair. 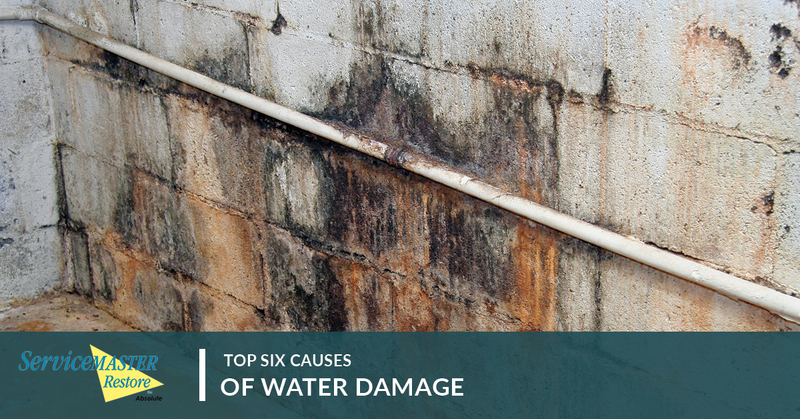 Pipes rust, hoses weaken, and these issues can only lead to water damage in your home. Check up on older appliances, especially washing machines and hot water tanks. Air conditioners need frequent servicing, and when they are not taken care of properly, they can collect quite a bit of moisture and leak into your home. There is no way to control the weather! Flash flooding, storms, and other natural disasters can lead to significant water damage in your home. Make sure to do everything you can to prepare for any impending damage, but keep your safety in mind first and foremost. If authorities say that you need to evacuate, we strongly agree with the suggestion. Not all of these causes are preventable, so keep that in mind. Take as many steps as you can to protect your home! When water damage strikes your home, be sure to call the professionals at SM Absolute! We can help you bring your home back to how it was before. Water damage restoration is our specialty, so we can’t wait to help you. Contact us today to learn more about both our residential and commercial services!